You've seen me on the Galaxy Cauldron! Now I'm on the Moon Kingdom! For those that do not know me, my real name is Nicholas Clark Manuel. But in the Sailor Moon Series, I portray a Spore OC under the Species Aerian, called upon as Archibald Kayin McShane, or Arch. Archibald is just an Alias he goes by to mask his Senshi ego, Maxis Aerian. Arch is a Spectrobe Master, an Otaku Senshi first. His Spectrobes are the key to repelling another invasion by both the Negaverse and the Krawl. Since Rallen is busy guarding the Nanairo System, he entrusts Arch to work with the Senshi in battling the combination of two evils. The Senshi will need to raise their own Spectrobes, and use them against this new Negaforce. Irl, I am a fan of Sailor Moon, My Little Pony, Spectrobes, Pokemon, Minecraft, and let's not forget the Fallout and Elder Scrolls Series. My style of Role Play is Narrative, third-person. My starting style was Screenplay format. I have an A.A.S. in Drafting and Design Technology, and I'm about to get a job filing for the Special Olympics, via my State's Department of Rehab's Links Program. Now that you know some things about me, I have one thing left to say. Let's rock, Iku Ze! It's me Yami from GC! Glad to have you here! Welcome to MKF! I hope you like it here! When prayers turn into promises, not even fate can stand in your way. Thanks, ladies, I hope this forum has a section for Crossover RPs. 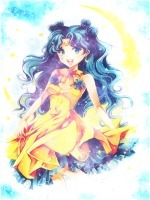 Sig Banner by Sailor Mercury of Galaxy Cauldron. Yes you can! The crossovers go into any of the Sailor Moon rp forums Just place it in the timeline that it fits. Do not place Sailor Moon crossovers into the Dreamland forum. Those are for non Sailor Moon roleplays. Be sure to R&U the rp rules before you start rping. Welcome to the boards Maxis! Dont for getting to read overy the rules for the board and RP sections! Subject: Re: Aerian Galaxy Power ENGAGE!